Snowblindness - Is It Real? Is there really such a thing as "snow blindness"? Yes there is! Snow reflects quite a bit more ultraviolet (UV) light than water or sand. When there is snow on the ground, up to 80% of UV light is reflected up, whereas only 25% is reflected up from water. This extra UV can "burn" the eye and cause corneal changes and discomfort. So don't forget to wear sunglasses when you are shoveling on a sunny day. 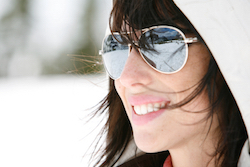 Wearing sunglasses with polarized lenses will further enhance your eye comfort on a snowy day. Polarized lenses reduce the glare and make time your outside more enjoyable. Not only that, but polarized lenses give you further protection from harmful UV rays. Just like putting on sunscreen to protect your skin, wearing proper sunglasses is essential for protecting your eyes!